SAPPHIRE ENGAGEMENT RINGS : LOVE2HAVE in the UK! The BEST! British made sapphire engagement rings set with coloured sapphires online in the UK. Love comes in many colours, and the choices of sapphires in our sapphire engagement rings come in many different colours for you to choose from, each one part of a rainbow of romance and true devotion. Sapphires are known as stones of wisdom and are also a symbol of integrity so, therefore, make a very suitable alternative to the more traditional diamond for an engagement ring. All of the sapphire engagement rings on this page are available with matching plain wedding rings for him and her. We can even offer exclusive discounts if you require a sapphire wedding ring set so please contact us for further details. Visitors to this section of our website may also be interested in our bridal sets as many of the sapphire engagement rings listed above are available with matching plain wedding rings for both the bride and groom. 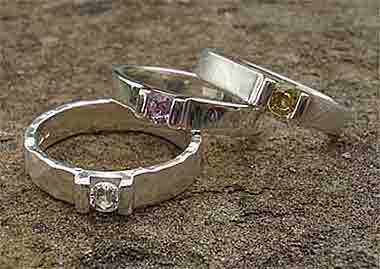 You will find these rings in the wedding rings section. Nothing on our website is imported or made abroad. All these sapphire engagement rings are designed and made by hand here in the UK with a passion and to the very highest of quality and craftsmanship. Additionally, we offer a full guarantee and an after sales service should you require it.